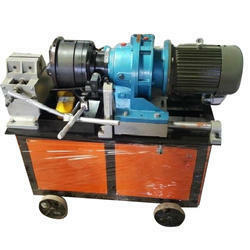 The Bar Threading Machine is use to cut the external threads on the bar with the help of Tangential chaser. Specifications: Re-bar dia 12mm to 50mm Threading size 2.5mm & 3mm. 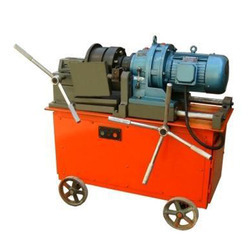 Length of Pedestal Box: 44"
Thread rolling machine also known as bar Thread Rolling Machine . Rods / Bars Threading Machine is use to cut the external threads with the help of Tangential chaser. Chaser is use as a cutter in machine. Rod / Bar / Component threading remain still, Die-head rotates. Leading Dealers for REBAR Threading Machines/ Reinforcement Threading Machines @ Most Competitive Prices.